Ó thaobh litríochta agus ealaíne, is leabhair álainn é seo. Thosnaíos á léamh le mo rang sinsir (4ú go 6ú) tar éis aonad faoin mbéaloideas. 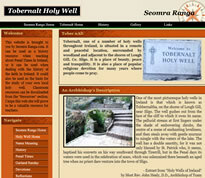 Chomh maith le sin táim tar éis an leabhair a úsáid mar bhunús de roinnt ranganna ealaíne agus dánta. Ta sceitseanna Olivia Golden go gleoite agus cabhraíonn siad go mór do thaithneamhacht an bhailiúcháin. Tá an litríocht sa scéal simplí go leor chun tuiscint, ach tá a lán saibhreas ag baint leis. Tá sé cabhrach go bhful foclóir do na focail neamh coitianta ag deireadh an leabhair. 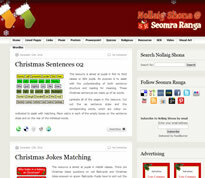 Is leabhar fíor-thaitneamhach é chun a léamh ós ard agus tá na scélta greannmhar agus suimiúil don aos seo (Nó aon aois, ceapaim). Chuaigh na scéalta “An Chéad Luch” agus “Paiste an Slua Sí” go háirithe, i bhfeidhm go mór ar na daltaí. Nuair a fiafraíos ó na daltaí an mbeadh siad sásta an leabhar a mholadh, dúirt duine acu go raibh na mná ‘sna scéalta i bhfad níos suimiúla anois ná mar a bhíodar léirithe ‘sna sean-scéalta! Táim ag tnúth leis an leabhar seo a úsáid tríd an bhliain chun é léamh ós ard sa rang agus táim lán sásta é a mholadh. This is a beautiful book – both from a literary and an artistic point of view. I began reading the stories with my senior class (4th to 6th) following a history unit about ‘Béaloideas’ and have also now used the book as a basis for some art and poetry lessons.Olivia Golden’s illustrations are stunning and really contribute to the enjoyment of the collection. The vocabulary in the stories is very accessible and simple, yet there is plenty of richness to be found. It was helpful to have the less familiar words translated at the end of the book also. It is an especially pleasant book to read aloud and the stories are very amusing and engaging for pupils of this age (or I imagine any age really). ‘An Chead Luch’ and ‘Páiste an Slua Sí’ were particular favourites. When I was asking the children whether they would recommend the book, one of them said that they liked it as the women were more interesting than she had seen them portrayed in other old fairy tales! I look forward to using this book throughout the year as a read aloud activity and would certainly recommend it. By Ann Marie O’ Donovan, St. Michael’s COI NS, Blackrock, Co. Cork. 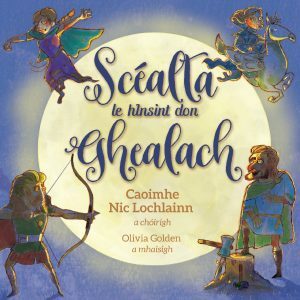 “Scéalta le hInsint don Ghealach” le Caoimhe Nic Lochlainn is now available to purchase from Cois Life for €12.00.